LAS VEGAS – Signify’s new Philips Vari-Lite VL10 BeamWash luminaire was unveiled at LDI 2018 in Las Vegas Oct. 19-21 after successful tests on prime-time television and live concerts were held earlier this fall. The first lighting fixture to be designed around the new high-performance Philips 25R Platinum 550W lamp, the VL10 BeamWash packs a new level of power, dynamics and personality into a compact, fast-moving body. The VL10 BeamWash produces 28,000 lumens of output from the concentrated power of the new lamp, making it the brightest and most versatile fixture in its class. Its 2.2-48˚ zoom range delivers a broad choice of looks, from crisp, tight beams to wide, smooth washes and mid-air blasts, enhanced by an unrivalled suite of creative beam effects. Among the effects choices available are dual overlaying prisms, an 8-slot rotating gobo wheel and an aperture wheel featuring 12 designs, including beam reduction to a laser-like 0.7˚ and a range of bold break-ups and aerial dynamics. Designers can access a further layer of design versatility with the exclusive new VL*FX glass animation wheel system, while mega-stepping, twist and shake control also add to the creative mix. Effects can be softened with the internal frost, and strong, even washes can be created using the dedicated wash mode. As usual, designers can choose from the full Philips Vari-Lite color palette: the enhanced CYM color system and fixed color wheel offer everything from the subtlest hues to the deepest reds and blues. 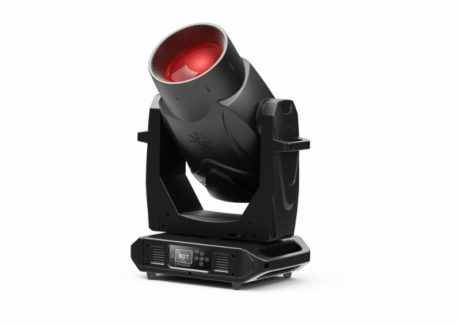 The fixture’s large 180mm front lens gives a stage presence usually associated with far larger fixtures, combining personality with performance in this compact, fast-moving body. Weighing just 33kg, the VL10 BeamWash is brighter, lighter and more versatile than any comparable fixture on the market. Signify Entertainment Lighting comprises the Philips Vari-Lite, Philips Strand and Philips Selecon brands, as well as the Philips Showline range of LED stage luminaire.